Whenever we go out of town for few days, we always used to worry about our plants as they need water on regular basis. 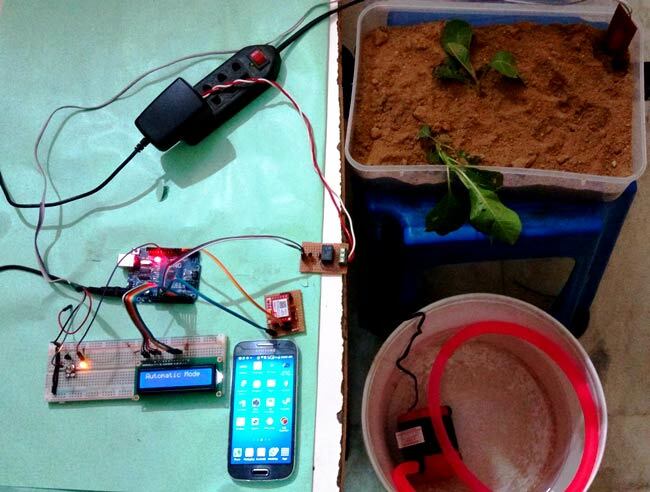 So here we are making Automatic Plant Irrigation System using Arduino, which automatically provides water to your plants and keep you updated by sending message to your cell phone. In This Plant Watering System, Soil Moisture Sensor checks the moisture level in the soil and if moisture level is low then Arduino switches On a water pump to provide water to the plant. Water pump gets automatically off when system finds enough moisture in the soil. Whenever system switched On or off the pump, a message is sent to the user via GSM module, updating the status of water pump and soil moisture. This system is very useful in Farms, gardens, home etc. This system is completely automated and there is no need for any human intervention. Here we have used TTL SIM800 GSM module. The SIM800 is a complete Quad-band GSM/GPRS Module which can be embedded easily by customer or hobbyist. SIM900 GSM Module provides an industry-standard interface; the SIM800 delivers GSM/GPRS 850/900/1800/1900MHz performance for voice, SMS, Data with low power consumption. The design of this SIM800 GSM Module is slim and compact. It is easily available in the market or online from eBay. Learn more about GSM module and AT commands here. Also check our various projects using GSM and Arduino for properly understand their interfacing. In this Plant Irrigation System, we have used a Homemade Soil Moisture Sensor Probe to sense the soil moisture level. To make probe, we have cut and etched a Copper clad Board according to the Picture shown below. One side of the probe is directly connected to Vcc and other probe terminal goes to the base of BC547 transistor. A potentiometer is connected to the base of the transistor to adjust the sensitivity of the sensor. Arduino is used for controlling whole the process of this Automatic Plant Watering System. The output of soil sensor circuit is directly connected to digital pin D7 of Arduino. A LED is used at the sensor circuit, this LED’s ON state indicates the presence of moisture in the soil and OFF state indicates the absense of moisture in the soil. If user wants to use SIM900 TTL Module then he should use 5V and if the user wants to use SIM900 Module then apply 12v in the DC Jack slot of the board. An optional LCD is also used for displaying status and messages. Control pins of LCD, RS and EN are connected to pin 14 and 15 of Arduino and data pins of LCD D4-D7 are directly connected at pin 16, 17, 18 and 19 of Arduino. LCD is used in 4-bit mode and driven by Arduino’s inbuilt LCD library. Working of this Automatic Plant Irrigation System is quite simple. First of all, it is a Completely Automated System and there is no need of manpower to control the system. Arduino is used for controlling the whole process and GSM module is used for sending alert messages to user on his Cellphone. If moisture is present in soil then there is conduction between the two probes of Soil Moisture sensor and due to this conduction, transistor Q2 remains in triggered/on state and Arduino Pin D7 remains Low. When Arduino reads LOW signal at D7, then it sends SMS to user about “Soil Moisture is Normal. Motor turned OFF” and water pump remains in Off state. Now if there is no Moisture in soil then Transistor Q2 becomes Off and Pin D7 becomes High. Then Arduino reads the Pin D7 and turns On the water motor and also sends message to user about “Low Soil Moisture detected. Motor turned ON”. Motor will automatically turn off when there is sufficient moisture in the soil. Further check the Demonstration Video and Code (given at the end) for better understanding the project working process. Code for this program is easily understandable. First of all we have included SoftwareSerial library to make pin 2 and 3 as Rx & Tx and also included LiquidCrystal for LCD. Then we defined some variables for motor, soil moisture sensor, LED etc. Then in void setup () function, serial communication is initialized at 9600 bps and directions are given to the various Pins. gsmInit function is called for initialize the GSM module. Then sensor is read in void loop () function, and motor is turned on or off according to the sensor status and a SMS is also being sent to the user using sendSMS function. Check the various functions in full code given at the end. Here the gsmInit () function is important and users mostly find it difficult to set if properly. It is used to initialize the GSM module, where firstly GSM module is checked whether it is connected or not by sending ‘AT’ command to GSM module. If response OK is received, means it is ready. System keeps checking for the module until it becomes ready or until ‘OK’ is received. Then ECHO is turned off by sending the ATE0 command, otherwise GSM module will echo all the commands. Then finally Network availability is checked through the ‘AT+CPIN?’ command, if inserted card is SIM card and PIN is present, it gives the response READY. This is also check repeatedly until the network is found. This can be clearly understood by the Video below. So with this Automatic Irrigation System, you don’t need to worry about your plants when you are away from your home. It can be further enhanced to be operated and monitored over the internet. This is a fine way to explain these mini micros. Thank you this morning for waking me up. I am totally new to Arduino, having never built anything. However, this is exactly what I am looking for to monitor moisture levels in a plant stacker system I am building. I have been searching the Internet and there are quite a few sites suggesting power should not be continually applied to the moisture sensor to prevent it from corroding. If I get one reading per hour it would be sufficient. One way to accomplish this would be to connect it to a timer that powers it up every hour for long enough to take a reading, then powers it off again. But it seems there should be a better way. Copper does not corrode easily, its turns green on oxidation. Even if we dont give power it will corrode. But if you dont want to provide power for long duration then use some Timer ICs which can give long time period. It wont work without this line. I want to do a project on "ardineo based solar automatice plant irrigation by voice mesage,with options .as, if we want to" ON press 1" and "if we want to OFF press 2". Hi...please I've implemented circuit and it works fine except for the GSM part. I don't receive the message even though LCD displays message sent. What could be the cause. ​GSM based arduino programmable automatic irrigation system with water level indicator,moisture sensor and temperature sensor. When the gsm module receives a message from the user the arduino should check the water, moisture and temperature level and send these details to the user via text message. Receiving this message user can decide whether the motor should be switch on for a certain time period.According to the message from user motor should switch on. As our project is same as yours.we have some doubt in programming.....So,please send your Arduino Programming for our reference.....As it will be usefull for us. Please I am working on similar project but I am fining it difficult to simulate with proteus because the Arduino and the GSM module do not have some pins showing. Any assistance will be much appreciated. Thank you. I m facing problem that while running code output is always high,means relay is always on . And if condition is running ....its print statement are displayed on lcd but loW condition noT running. - (If you have modified the code) you may have messed up some command. (Maybe you are sending "digitalWrite(motor, HIGH)" when you should send "LOW" instead). Please help me bro . hii im using sim800a type gsm module. check wheather my module outout is ttl or not..? I want to buy this project...can u help me ???? in the above given project ,where u have assigned the analog pin for moisture sensor in arduino uno..
i am doing this project but unable to get the 3.8v output from the ckt dig.and the relay is also not working when connected to ckt.i check the relay is not damaged.so can u help me please. Thank you your kindly effort. I haven't any comments. Thank you again. I implemented this circuit but want to add remote control functionality using SMS by the user. How can I improve the code to enable to remotely control the system using SMS ie overriding the automation when arises. can I get the schematic of the project using the Fritzing software? I want to etch the circuit on a printed circuit board. Thank you so much sir for this helpfull project. hello,thanks for uploading this paper,i`ve been working on this.But i am confusing about what software you use for that circuit digest in your paper? Hello, can i know how to get the GSM Module in library proteus ? Hello! We are doing a model of this for a Electrovagenza and every part of it is working except for the motor part. Motor is running due to the AC supply and not through the relay circuit. (Can you please mention the diode part number used in the circuit and is it compulsory?). Speedy reply would be much appreciated. Hey, When I tried to run the code in Arduino's programming software. It showed me some errors. Can you please find those and send me ASAP. We can off motor with sms by mobile? How can I use rain sensor with it. Please help me.